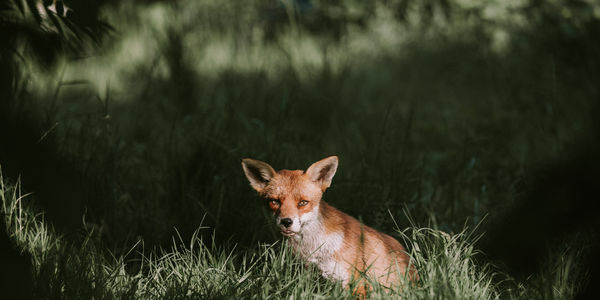 Traditional fox hunting — hunting foxes with hounds — has been banned for nearly 15 years in the majority of the UK. The practice was outlawed in Scotland in 2002, two years later, Wales and England followed suit. Now, the only legal hold out for this barbaric sport is in Northern Ireland, but that doesn't mean hunts don't continue in the rest of the country. Hunting parties all around the UK gather in secret with their hounds to let loose terror on their local fox population. Once the hounds get the scent of their prey, it is likely a matter of time before the hunted ends up in the jowls of trained dogs. Apparently, that's what happened in the village of Peaslake in Surrey. Activists from the Guildford Hunt Saboteurs group say they caught riders along with a pack of 30 to 40 dogs terrorizing the neighborhood. The dogs set upon a pack of deer, dispersing them in all directions before they set their sight on the true "prize" a red fox. The dogs tore through people's gardens chasing the fox as the huntsmen looked on. Finally, when they found the fox hiding in bushes they lunged at it, tearing it to shreds in seconds. One can only imagine the terrible death the fox experienced as it was torn to shreds by dozens of excited hunting dogs. The anti-hunting activists took video of the aftermath. In it, you can see a lifeless fox, soaking wet in its own blood, its limbs sprawled out and eyes bulging in a fixed stare of terror and in the background members of the group weep in empathy for the poor animal. If fox hunting with hounds is outlawed then there is no excuse for this hunt and this gross display of barbarism. Those responsible must be caught and prosecuted. Sign the petition and ask the Surrey Police to make this case a priority and bring these poachers to justice.